Hi! This is my first Model Monday photo shoot. It was kind of hard to find just the right outfit because the temperature went from the 30s to the 50s then back down to the 30s. The sweater isn't quite orange, but the coral color went well with the green scarf. Hope you like the shoot. Wow! You weren't kidding when you said the wardrobe here was outstanding! (laughs) I hope you're finding what you want. Something fun for a Model Monday shoot. Ooooo! Cool! Those are fun. I'm just not familiar with everything here. Is this too springy? I love the color. Yeah, I think it is. But don't go by me! You get to choose. Are you sure you want a skirt? I forget, what is your favorite color? I have two. Green and orange. Hmmm, those are difficult. But we'll find something. 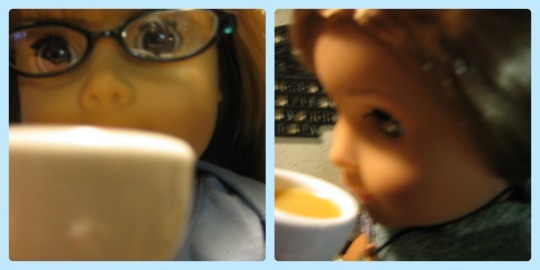 Maybe Bonbon and Camila will sniff something out for you. A Bientot! Tchau, ate mais tarde! My first encounter with Maggie Stiefvater's writing was with the Wolves of Mercy Falls series which includes Shiver, Linger, and Forever. To date I have only read Shiver. Her style is expressive and detailed. I had heard really good things about The Raven Boys and when it popped up as a free eBook I jumped and am glad I did. The main characters are between 16 and 18 years of age with one very unique member in the group. Maggie is quite an artist too! Her illustrations of the group completely douse my inner mind's depiction (see below). If you have interest in ley lines and mystic power, you may just enjoy this story. This is book one of four and I am looking forward to reading more. Right now, I'll focus here in my own somewhat cryptic way of reviewing what I've read without giving spoilers. Blue is our main character and she is not a Raven Boy. In fact, most of her life she has avoided Raven Boys, but this group of 4 is different. Blue's family is filled with psychic sight; she's a little different. She doesn't have "the sight" but she has other great qualities. On top of that she is friendly, compassionate, understanding, inquisitive, respectful, unique, and sensible. I love her sensibility like Elinor Dashwood. Gansey, Adam, Ronan, and Noah - four distinct personalities. You're not sure how they can be friends like they are. While reading I kept picturing them as the guys from Entourage, but that's my own personal association - fun, but Noah is 1,000 times more interesting than Turtle. The threads that hold this group are thin yet strong like spider webbing. They can also be unraveled. As the group embarks on the quest we learn more about each character even the side characters and minor characters get a bit more definition to them. This book opens the story and lays the groundwork to explore additional facets of the quest and Blue's desire to not exactly find her true love. The pages are filled with intrigue, adventure, mystery, power, death, destruction, exploration, decisions, and secrets. Not exactly spoiler alert. Some may consider it odd for these teens (boys) to live in a warehouse and be dismayed with absentee parents. However, the boys attend a private school. Gansey is so wealthy he owns the warehouse and his parents indulge his quest whim. Ronan's father is dead and he tries to stay out from under his overbearing older brother's thumb. Adam does live at home with his parents, but it is not a good situation. Noah...Noah is very special. Blue lives with her mother and aunts. They are very involved and supportive, but also free spirits and have their ways. Plus they step up to help and show love. This one has been waiting patiently on my nook for a while. I'm glad I finally got to it. I really liked it a lot. Has kind of Twilight Zone, X Files, Twin Peaks, Practical Magic feel to it. I like the character development throughout and how the story progresses in a pointed direction with very few tangents. Haley recreated the cover of The Wednesday Witch; I found a book cover too. The very first Nancy Drew Mystery...The Secret of the Old Clock by Carolyn Keene. I haven't read this one in a while, might be time for a re-read. It is a favorite. Have you read it? What is your favorite part? Did I do okay with the cover? Lea, time for a tea review. 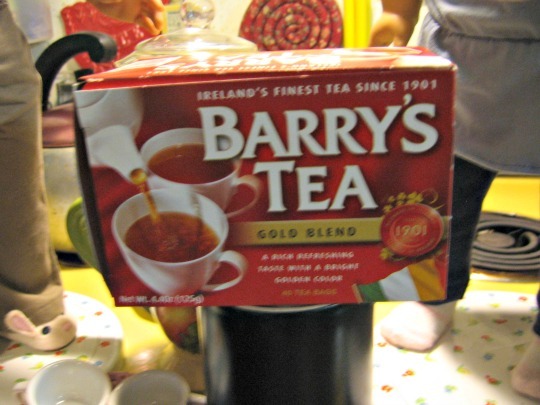 We're tasting Barry's Tea Gold Blend. Neat! 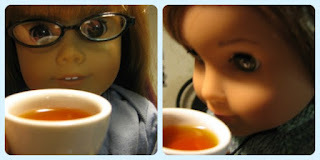 This is my first tea review. How do we start? What does the box say about brewing? Hmm, oh, here. 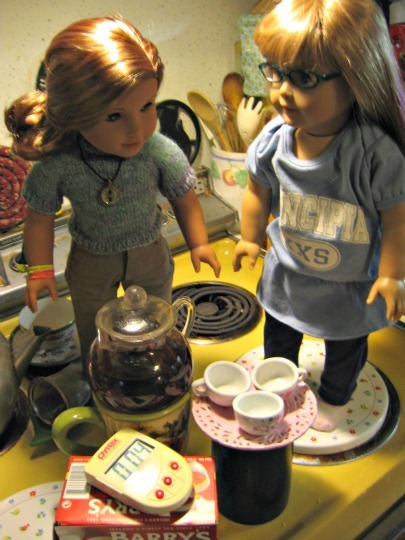 "Use one teabag for each cup, alternatively, use a warmed teapot, adding one teabag per person and one for the pot." I have the teabag. Anything about how long to brew? Here it says "brew for 3-5 minutes, depending on how strong you like your tea." Let's set the timer for 4 minutes. Now we wait. Wow! It's pretty dark already. Any other important facts about the blend? It's has a fair trade disclaimer. Let's see..."Sourced from the finest tea gardens of Rwanda, Kenya and the Assam Valley of India, our Gold Blend is famous for its rich golden colour and much loved taste." Wow! It's even darker now. I'm not sure I'd call that gold. Smells...I don't get much beyond tea. Nothing floral or fruity or spicy. We'll try it three ways: plain, sweetened, and sweet with milk. 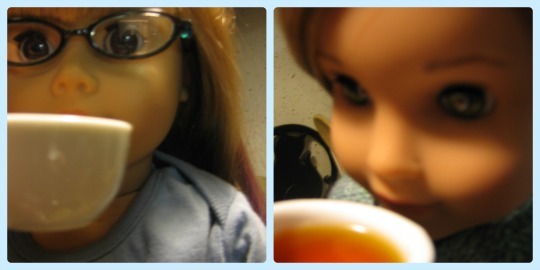 Well, it's a nice tea taste, but nothing extraordinary to me. Would be good iced. It's hot and rich, but is missing something. We're using white, table sugar for the next two cups. Approximately 1 teaspoon. This adds another level to the tea. Not bad. This is better than the plain. The milk makes it a bit more creamy, but still not super special. Barry's Tea Gold Blend makes a nice cup of tea. Since Barry's Tea is imported tea, your grocer may have the price pretty high. I picked up this box on sale. It's good, but I like the Barry's Irish Breakfast better. Do not oversteep; has the potential to get bitter. It is good with honey and sugar in the raw as well as regular sugar. You can use your flavored honey in this one to add another flavor note to the cup. 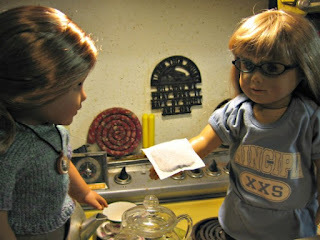 So how did I do for my first tea review? There is so much to know about blends and flavors and locations. We're not experts. But we like relaxing with a good cup just like we are now.